copyright © Vernita Bridges Hoyt 2001-2008 - All Rights Reserved. Contact me for pricing and schedule. Riley was caught in the above snapshot as he romped through a field of Texas bluebonnets. The pure colored pencil portrait was worth the approximate 100 hours of rendering time. His mother was delighted with the portrait. 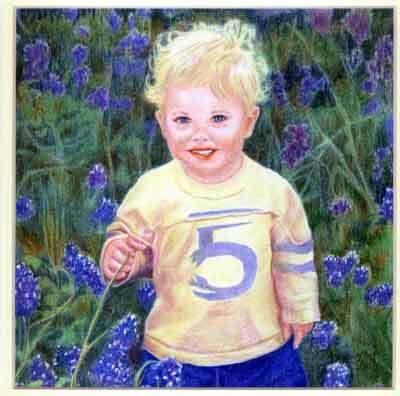 "Little Boy Blue" hangs in a private art collection near Austin, Texas.